proliferating during that time wherein they wore motorcycle helmets in executing murder offenses in Vigan.. He likewise sponsored an Ordinance amending certain provisions of the Ordinance on Astray Animals in Vigan. On 2007, Councilor Benzon ran as Vice Mayor of the City of Vigan. It was at this moment of his career as a public servant that he had encountered struggles during his campaign. Although he was defeated, Tante Benzon's desire of helping the people of Vigan did not stop. Instead he continued to serve the people through sponsoring medical missions and provided assistance to his barangay mates during the onslaught of typhoons "Pepeng" and "Ondoy". His passion for public service urged him to again ran for public office as an independent candidate as a City Councilor on the recently concluded 2010 Automated elections. This time he had the full support of the people of Vigan making him the No. 8 City Councilor. 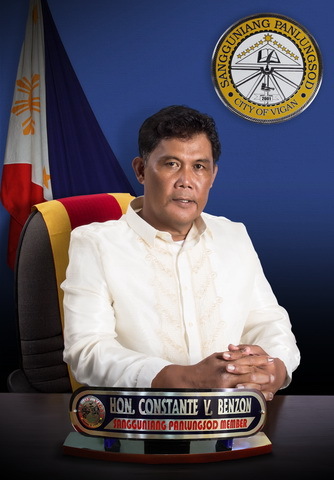 As with many great men and women who gave extraordinary service to our nation, Councilor Benzon would always speak the truth, would always give a straight unvarnished answer, and will do his very best to fight. NO. 03, S OF 2012: PRESCRIBING THE RATES & GUIDELINES FOR THE OPERATION OF THE VIGAN CONVENTION CENTER. NO. 09, S OF 2012: FORMULATING THE POLICIES ON MANDATORY/PRE-EMPTIVE EVACUATION OF THE CITY OF VIGAN. NO. 12, S OF 2011: STRENGTHENING THE PUBLIC RELATION & INFORMATION OFFICE AS AN ECONOMIC ENTERPRISE OFFICE. NO. 14, S OF 2011: REGULATING THE EMBALMING OF CADAVERS AND PRESCRIBING PENALTIES FOR VIOLATION HEREOF. NO. 01, S OF 2006: ESTABLISHING A PILOT COMMUNITY KILN OVEN FACILITIES AND ITS COMPONENTS WHICH IS NECESSARY FOR THE DEVELOPMENT OF CLAY INDUSTRY AND APPROPRIATING FUNDS THEREOF. NO. 04, S OF 2006: GRANTING AN ANNUAL DEVELOPMENT BUDGETARY AID TO ALL THE BARANGAY GOVERNMENT OF VIGAN TO AT LEAST ONE HUNDRED THOUSAND PESOS PER BRGY GOVERNMENT DNA PROVIDING GUIDELINES FOR ITS AVAILMENT. NO. 18, S OF 2006: GIVING MONTHLY PERFORMANCE BENEFITS TO DESERVING BRGY TANOD BRIGADES AND PROVIDING GUIDELINES HEREOF. NO. 15, S OF 2005: ESTABLISHING THE BRGY. OUTSTANDING PUBLIC SERVICE AWARD TO ELECTED BRGY. OFFICIALS OF VIGAN WHO COMPLETED TWO OR THREE CONSECUTIVE & INTERRUPTED TERMS AS BRGY CAPTAIN OR BRGY COUNCILOR & APPROPRIATING FUND THEREOF. NO. 19, S OF 2005: MANDATING THE RIGHT SIDE PORTION OF STREETS TO BE USED FOR FUNERAL PROCESSION. NO. 10, S OF 2004: REPEALING ORDINANCE NO. 06, SERIES OF 2003 OTHERWISE KNOWN AS “ HELMET ORDINANCE OF 2003). NO. 17, S OF 2012: APPROVING THE APPLICATION OF SMART COMMUNICATIONS INCORPORATED TO UPGRADE THEIR COMMUNICATION FACILITIES THROUGH THE INSTALLATION OF FIBER OPTIC CABLES BETWEEN CELL SITES IN VIGAN. NO. 25, S OF 2012: REQUESTING THE TOURISM INFRASTRUCTURE AND ENTERPRISE ZONE AUTHORITY (TIEZA) THROUGH HON. MARK LAPID, CHIEF OPERATING OFFICER, TO PROVIDE FINANCIAL ASSISTANCE TO THE CITY GOVERNMENT OF VIGAN FOR THE ESTABLISHMENT OF THE VIGAN CONSERVATION COMPLEX. NO. 26, S OF 2012: REQUESTING THE PROVINCIAL GOVERNMENT THRU HONORABLE LUIS “CHAVIT” SINGSON, GOVERNOR, PROVINCE OF ILOCOS SUR, FOR THE CONCRETING OF THE ACCESS ROAD LOCATED NORTH OF THE UNIVERSITY OF NORTHERN PHILIPPINES (UNP). NO. 33, S OF 2012: REQUESTING FINANCIAL ASSISTANCE IN THE AMOUNT OF FIVE MILLION PESOS (P5,000,000.00) FROM THE PROVINCIAL GOVERNMENT THRU HON. LUIS “CHAVIT” SINGSON, GOVERNOR, PROVINCE OF ILOCOS SUR FOR THE CONSTRUCTION OF THE VIGAN CONSERVATION COMPLEX LOCATED AT SAN JULIAN SUR. NO. 21, S OF 2011: REQUESTING THE CONGRESSMAN RYAN LUIS V. SINGSON, FIRST DISTRICT OF ILOCOS SUR TO FILE A BILL IN CONGRESS DECLARING THE ONLY WORLD HERITAGE CITY IN THE PHILIPPINES AS SPECIAL TOURISM ZONE AND ESTABLISHING THE HERITAGE CONSERVATION FUND.